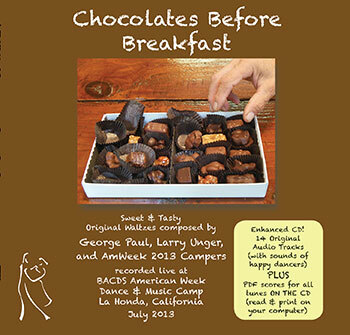 The latest in the series of BACDS waltz CDs, “Chocolates Before Breakfast”, is in stock and available for purchase. You can order it here online, or support your local musicians and pick it up at one of our local dances. If you're not in the San Francisco Bay Area, please order here online, and shipping is free to US addresses.